The official court surface for the Australian Open, ReboundAce® from California Sports offers an affordable, long lasting tennis surface that brings high performance without costly maintenance. 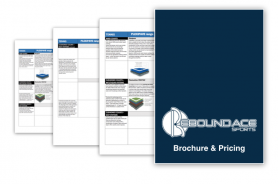 To get started, request a copy of our brochure and pricing guide. Used by the pros, it protects your joints and makes tennis safer and more enjoyable. For a copy of our brochure and pricing, enter your details below and a member of our team will be in touch within 24 hours. Choose your colours and build a new court or install over an existing surface. Laid in days, it'll protect your joints for years to come. ReboundAce surface coating is made up of several layers of cushioning designed to give you superior joint care so you can play for longer without tiring or risking an injury. The surface is slip resistant and water runs off quickly, meaning less delay after rain. Tested for over 30 years now, ReboundAce colour won't fade even after years of harsh sunlight. Choose between more than 10 different colours and styles, or create a custom court design. 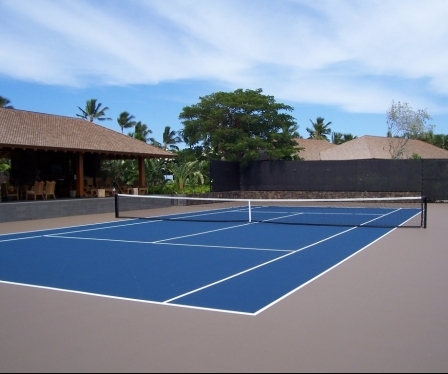 "A firm yet perfectly cushioned hardcourt that is a delight to play on in all conditions. ReboundAce provides a quality, comfort and consistency every owner and player will appreciate." Whether you're in charge of a busy family home, a sports club, school or you're simply an avid tennis fan enjoying your retirement – our tennis surfaces are the ideal match. ReboundAce® cushioning layers absorb shocks and reduce muscle fatigue. They take the stress off your body and are softer on your joints. ReboundAce® is used around the world by real sports pros, and is the surface of choice for multiple major sporting tournaments. Now you can enjoy the same quality surface in your own home or organisation. Innovative shock absorbing surface prevents dead zones and keep the ball bouncing evenly in all conditions. "I have played and coached on just about every court surface there is and I regard the new generation of ReboundAce® as the best cushioned hardcourts on the market today,"
Maintaining a play-ready tennis court can be a full time job. Installing our surface means your court is ready to play whenever you are - without the hassle. Most courts break down and eventually need to be fully replaced. ReboundAce® lasts years and can be recoated for a fraction of the cost of a new court, saving you thousands over its life. ReboundAce® can be installed over existing damage. Even if your surface is cracked, discoloured or uneven, our layering system can transform it into a stunning good-as-new court. 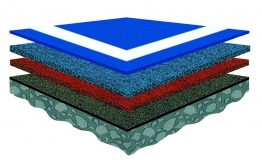 With a 5 year warranty and an indefinite life expectancy with minimal top layer maintenance, ReboundAce® provides the highest performance to price ratio on the market. What Makes Thousands Of Happy Customers Choose Our Surfaces Every Year? California Sports Surfaces courts can be installed both indoors and outdoors instead of or on top of concrete or asphalt. It's perfect for seasoned tennis players, enthusiasts and beginners. California Sports Surfaces uses a unique layering system that is upgradable and can be customised depending on how much cushioning you want when playing. Plus, you'll enjoy the perfect amount of traction. Synthetic grass surfaces harbour bacteria and contaminants that can cause infection if you fall. Our surfaces stay clean and keep you safe from this. Plus, our layers are made up from recycled rubber material and are environmental friendly. Three easy options to help get you started with the worlds most advanced tennis surface. Build a court exactly the way you want it - and for a reasonable price. Our expert design and construction team will scope, design and build your new tennis court from scratch. Install our surface to hide damage and refresh the look and feel of you existing court. Made to measure, our team will install your Sports Surface for you. For schools, clubs, universities, resorts and more. Get a court that delivers what your clients want and have a sports surfacing partner every step of the way. Q: Do you offer court designs for sports other than tennis? A: Yes, we also offer surfaces and courts for basketball, netball and even cricket as well as multi sport courts with multiple court line markings. Q: What is California Sports Surfaces? A: California Sports Surfaces is a company who produce a high quality, high performance range of tennis court surfaces, as well as surfaces for other sports. Q: Do you offer installation on my existing court? A: Yes, our installers will measure out your existing court and work with you to clean up your existing surface and make it ready to install our layered system on top. It's fast and easy. A: Our installers are based all around Australia in every major state, and our company is headquartered in Melbourne, Victoria. Good players and beginners alike know that quality tennis takes a quality tennis court. So whether you're hosting a weekly residential game at your home, or resurfacing a public space, make sure you invest in a surface that lasts. Copyright California Sports Surfaces Pty Ltd. All Rights Reserved.